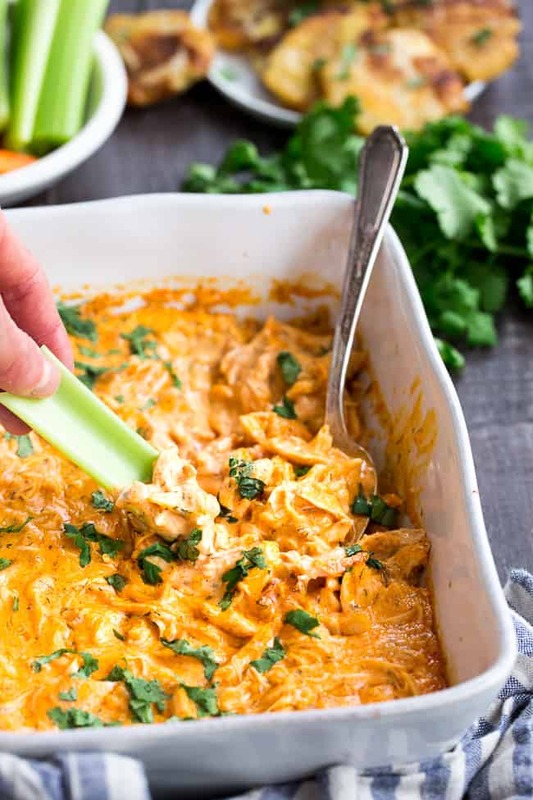 Perfectly creamy and packed with spice and flavor, this buffalo chicken dip is so ridiculously tasty that you’d never guess it’s Paleo, Whole30 compliant, dairy-free, and keto friendly! Use as a dip for veggies, tostones, or as a topping for sweet potato toast or a baked potato to make it a full meal! 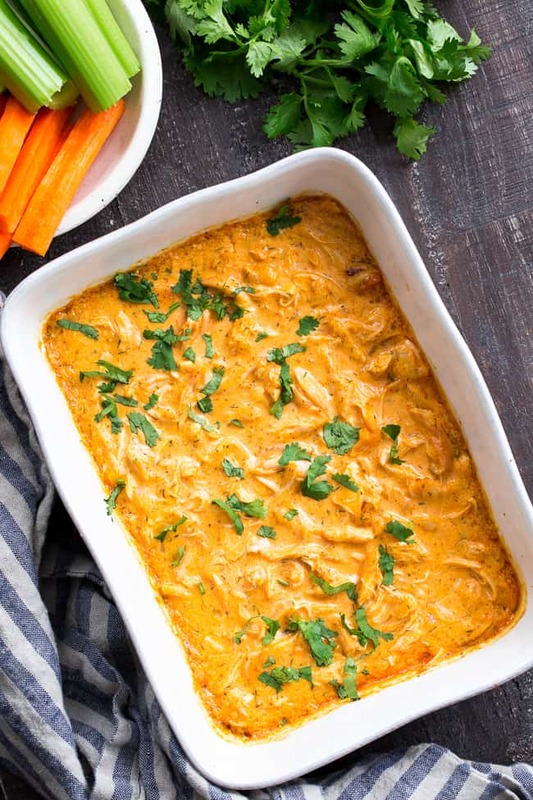 Buffalo chicken dip is such a classic (for the non-paleo and paleo, alike) that I’m surprised it’s taken me this long to get a recipe up! Better late than never – as always – this delicious dip, that doubles as a topping (just like my creamy chicken spinach artichoke dip) was well worth the wait. And don’t you worry – it’s such an easy recipe to throw together that it will no doubt be on your “must repeat” list once you try it. So, I guess I’m saying that you never have to live without it, from this moment, forward. I guess one of the reasons I shied away from making a buffalo chicken dip is that in the past, spicy foods didn’t seem to agree with me. 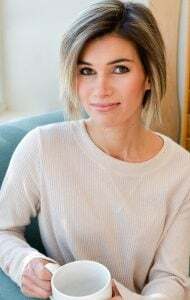 It’s funny – that when you do a Whole30 and eat squeaky clean for a few weeks, how all those things you -thought- bothered you just don’t seem to anymore. After making my crispy baked buffalo chicken wings, I realized that I can, in fact, eat spicy food as long as I’M THE ONE COOKING IT. 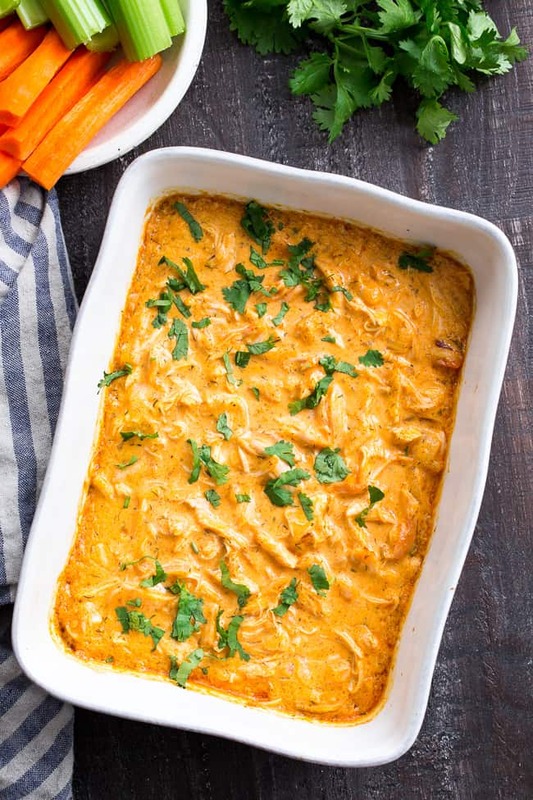 …It’s the love child of those crispy baked buffalo chicken wings and my creamy baked chicken spinach artichoke dip, and it’s just as awesome as it sounds. Packed with flavor, oh-so-creamy, super easy (really!) and makes enough for a crowd with little effort. 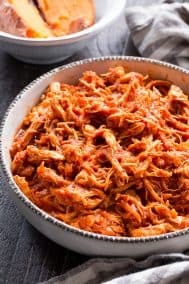 And hey – if you have leftover cooked chicken to use – you can literally throw it together in minutes! 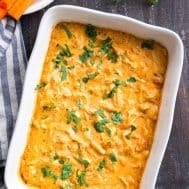 As with my other baked chicken dip, this one uses a combo of my fast homemade mayo – which I HIGHLY recommend using over a store bought avocado oil mayo for the flavor alone – and coconut cream. 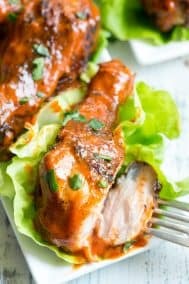 I also threw in some sautéed onions and garlic – because YUM – and of course plenty of Whole30 compliant hot sauce and seasoned cooked chicken. Once baked, you can dip your veggies, tostones (my favorite!) 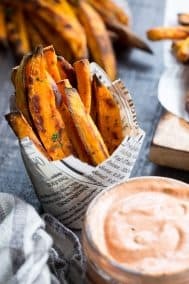 baked french fries or sweet potato fries with reckless abandon – all while knowing that you’re doing your body good. 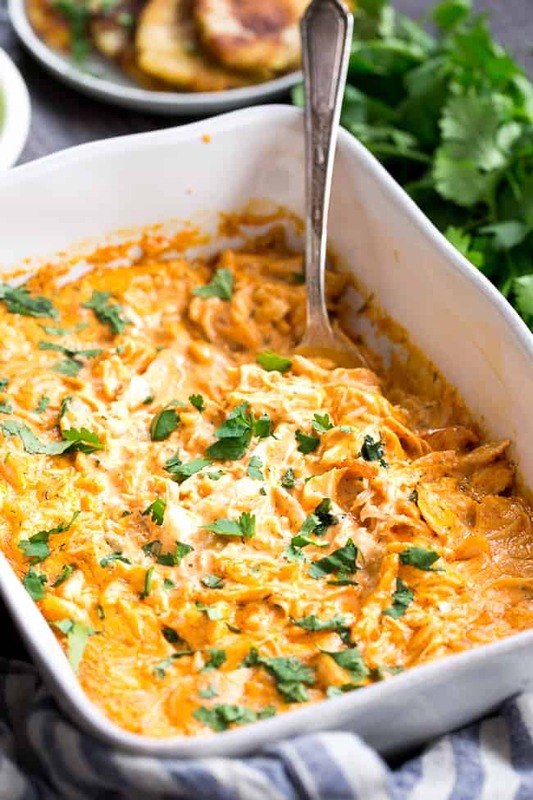 If you want to make this buffalo chicken dip into a full meal, top a potato or sweet potato and serve with a big green salad – perfection! I hope you’re ready to swoon over this – let’s cook! 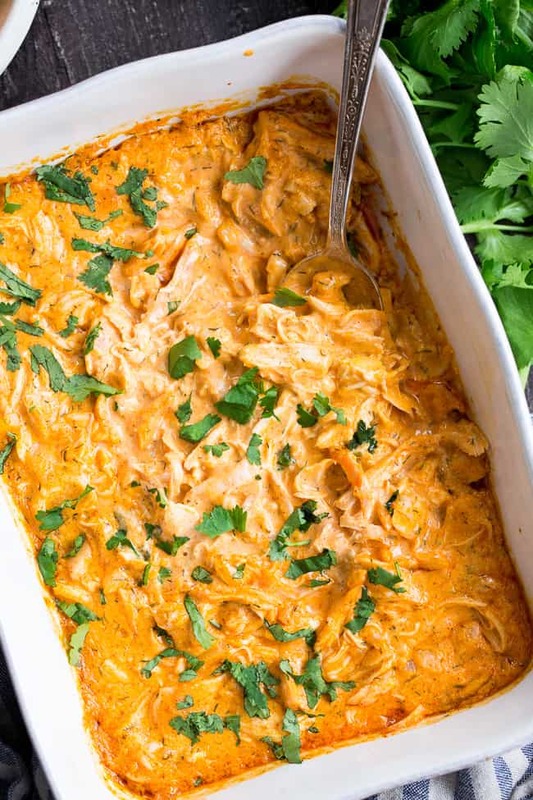 Perfectly creamy and packed with spice and flavor, this buffalo chicken dip is so ridiculously tasty that you'd never guess it's Paleo, Whole30 compliant, dairy-free, and keto friendly! Use as a dip for veggies, tostones, or as a topping for sweet potato toast or a baked potato to make it a full meal! 2/3 cup coconut cream this is the thick part of a chilled can of coconut milk, you can also purchase it separately. Preheat oven to 400 degrees and line a baking sheet with aluminum foil. Place chicken on baking sheet, drizzle with olive oil and sprinkle with salt and pepper. Bake for 15-20 mins until cooked though, remove from oven and set aside to cool. Lower oven temp to 350 F.
Meanwhile, heat a small skillet over med heat and add the ghee. Sautée the onions until soft, then add the garlic and cook, stirring until just softened. Remove from heat and set aside. 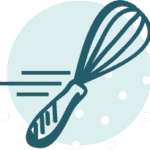 In a large mixing bowl, whisk together the mayo, coconut cream, mustard, garlic powder, onion powder, dill, paprika, hot sauce and lemon juice until smooth. Shred your chicken breasts, then add them to the mixture along with the cooked onions and garlic. 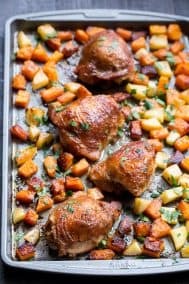 Stir to combine, then transfer to a small casserole dish and bake in the preheated oven (350) for 20-25 minutes until the outer edges bubble and dip is heated through. Serve warm with veggies, tostones or homemade plantain chips, or over a baked potato or sweet potato for a meal. Enjoy! I was excited for you to post this! It looks great – I am going to make it for a girls night i have coming up this weekend. The only ingredient I don’t have is brown mustard…if I skipped that would it change the taste very much? (I can pick some up from the store if it will just thought I would ask!) Thanks! This looks so delicious! I can’t wait to make it. Do you know what counts as “one serving”? Is that about a cup? I’m always confused about that…thanks in advance! Hi! Thank you for the response! Sorry, I didn’t clarify that I meant using it for a meal. So how much would each person be able to have (roughly how many cups??) if there’s 8 servings for a dinner portion? I’m just trying to figure it out for the nutrition facts/portion sizes! Thanks so much! Hi! Depending on what you eat it with I’d say about 6 dinner portions. Made this last night and everyone loved it! Served it with roasted potatoes to make it a meal. Definitely making it again!! This is a keeper! Thank you so much for sharing this recipe! Made this for dinner tonight, and it is delicious! Hi- I am excited to try this recipe but have a coconut and cashew allergy (tragic I know). What are your thoughts on using almond milk instead? I used almond yogurt (we’ve got coconut and dairy allergies) and it worked splendidly. I would not use almond milk…I think it’d turn out far too liquidy. I’ll try this brand of coconut cream. The Trader Joe’s brand tastes very much like coconut. Any idea how this would work in a crockpot for a work function? I don’t know what I did wrong but mine totally tasted sweet like coconut. I was so disappointed ? Hi! What type of coconut cream did you use? That could’ve been the issue, sorry it didn’t work out! That Buffalo Chicken Dip was the hit of the Party. They loved it ! I made this last night for the Super Bowl and it was amazing! I used Dijon mustard because I didn’t have brown mustard and it was still delicious. 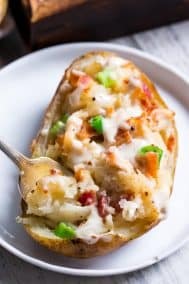 I was worried I would feel like I was missing out since there were so many other yummy foods and I’m doing Whole 30 but I was so obsessed with this that I didn’t care at all! 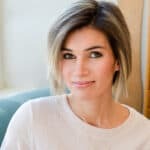 Just found out about you, Michele, from taking over Whole 30 recipes on Instagram and I’m loving your site! Thanks for all you’re doing! This is fabulous!! You wouldn’t know it was a healthier version of a party dip! We made this for the superbowl and my husband ate half the dish 🙂 Super delicious!! 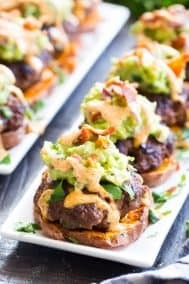 This almost converted all of my friends to Whole30! It was such a hit! So, I reserve my comments on recipes for the truly spectacular. And here I am. This is knock your socks off GOOD. My husband – who is also doing the whole30 with me – and my daughter – who is not – both asked for seconds and for me to double the recipe next time. 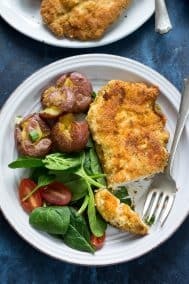 I served it with baked potatoes and added 3 tbsp of nutritional yeast. It will without a doubt be going into my regular meal plan! This is a little more time consuming than traditional dip, but no flavor is lost in this Whole30 compliant dip. Could you make this the night before to serve the next day? I am wondering the same! Thinking about making it the night before and bringing it to a potluck. Also wondering if it would be OK served cold? I think this is good warm or cold! This is downright magical. Kinda weirded out with coconut cream at first but decided to give it a go. This dish is a total game changer. I can’t believe it’s not dairy. Might leave off the onion next time as I found the overall flavor a tad sweet (I definitely used unsweetened coconut milk) and hubs is not a huge fan of sweet food. I, however, gobbled down 2 helpings on a potato before I realized I needed to hit the brakes. Make this, folks. You will not be disappointed. This looks delicious! Making it tonight for a party! Is the nutritional info for the whole dish or per serving? Thanks! Oh. My. Gosh. My friends are all gluten free and dairy free so finding a recipe that can accommodate that and taste good is difficult. I made this last night and it was phenomenal! I honestly couldn’t tell the difference between this and traditional buffalo chicken dip. Honestly, I think I liked this more! This will definitely be a go to recipe for me. I had some fresh jalapeños leftover so I chopped them up and added them to this! A little extra spice but such good flavor! This was fabulous and easy which I’m all about! This will definitely be on regular rotation at my house. 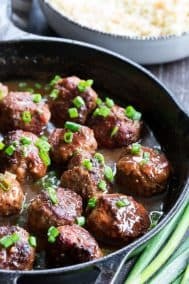 Is there a way for this recipe to be done in the crockpot? This recipe is all things good! I cannot get enough!!! I made this for a Super Bowl party at work and it was gone so fast! This is my go-to appetizer for family events. I tend to add a bit more chicken only because we like it “loaded”, but this is one of my favorites. Nope it’s definitely supposed to be thick so something’s going wrong. I wonder if the coconut cream isn’t solid enough to begin with, not sure.